In the eyes of many people the Griffon-powered Spitfires and their derivatives were the epitome of grace. In contrast to the more rounded contours of the earlier Merlin Spitfires the greater angularity of the later types exuded a sense of greater power. Added to the structural changes was the ability to carry an increased variety of weapons at faster speeds and longer distances. All, however, was not that successful as the last manifestation of the design would prove. The Spiteful and Seafang undertook their maiden flights just as the jet age was getting into full swing and for all their laminar flow wings and other refinements they could not compete on level terms as a succession of jet fighters entered service with the Royal Air Force. With their demise came the end of the Spitfire line, although the wing technology was to reappear again on the jet-powered Supermarine Attacker for the Fleet Air Arm. This slim volume attempts to tell the story of the Griffon-powered aircraft from the first tentative steps of the Mk.XII to full-blown production aircraft in the shape of the FR.18 and the F.24. 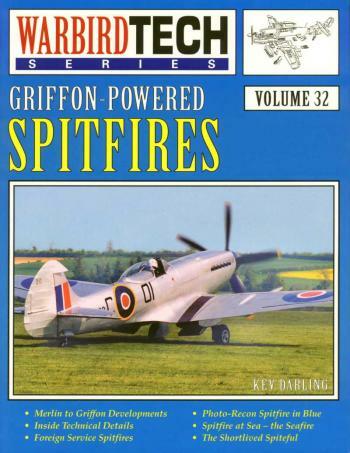 In order that the story should appear complete, the seagoing versions of the Spitfire, the Griffon Seafires, are also included. Within these covers are the in-depth details of the fighter versions plus the photo reconnaissance variants and their usage by the strangely named THUM (Temperature and Humidity) flight. Overseas use of the Griffon Spitfire is also covered, thus images from as far apart as Thailand to Egypt appear. The adventures of the late marque Seafires of the Fleet Air Arm in Korea are also covered where they performed their task admirably, sometimes against great odds. The appearance of the jet fighter saw the Spitfire being replaced by such types as the Gloster Meteor and the De Havilland Vampire. They were to remain in service with the Royal Auxiliary Air Force until its sudden disbandment on 10 March 1957. In the service of the Fleet Air Arm the Seafire and other piston-powered aircraft lasted slightly longer until they too were replaced by jet aircraft, although in this instance they came from the same builder, Supermarine. This then is the story of the second generation of the Supermarine Spitfire in words, pictures, and technical diagrams from a slightly different perspective. For helping me create this work I would like to thank the following: Peter Russell Smith for allowing me access to his extensive photo collection yet again; the doyen of Spitfire historians, Eric B Morgan for access to his collection of Spitfire material and for his inimitable assistance; and Chris Michell of Airframe Assemblies based on the Isle of Wight for taking time out to photograph a series of disassembled aircraft for me. Others worthy of mention include Damien Burke, Nick Challoner, Danny Jacquemin, Dave Stewart, and Sander Wittenaar. Yet again I make mention of Dennis R Jenkins for his design layout and of Dave Arnold and all at Specialty Press for their assistance and longdistance support.